Changing business model and Finesse ERP system help shift leading test and measurement equipment manufacturer into high gear. Through across-the-board integration with Finesse, GKN Aerospace, Engine Products Division, now has on-demand access to vital project information as well as tighter control within their accounting and purchasing departments. The result is increased accuracy, lower project costs and maximum efficiency throughout operations. Integrated manufacturing solution forged with Finesse: United Technologies successfully develops higher engineering and production capabilities by controlling scheduling of all project phases and managing resources easily and more efficiently, which dramatically reduces their time to market. Forward Technology designs and manufactures plastic assembly and leak testing equipment including: ultrasonic welders, hot plate welders, spin welders, vibration welders and thermostakers. Power Engineers Inc. is a full-service multi-disciplinary design engineering firm with offices worldwide. Power offers expertise in electrical, civil/structural, environmental, architectural, mechanical, information technology, communications and geographic information system engineering. Sechan Electronics designs, fabricates and tests sophisticated, highly-reliable electronic and electro-mechanical systems for the Department of Defense. Vogt Power International Inc.:specializes in the design, manufacturing, and supply of Heat Recovery Steam Generators (HRSGs) and Aftermarket related services. MIdrex Technologies Inc. is an international process engineering and technology company and has been a leading innovator and technology supplier for the direct reduction of iron ore for more than 30 years. The oldest existing manufacturer of X-ray medical equipment in the United States, Fischer has advanced the technology from its early uses for discovery of tuberculosis, the most common cause of death in the early 20th century, to a more recent application -detecting breast cancer, the most prevalent form of cancer among women. KHS is the recognized leader in processing and packaging solutions for fluid products. In the country that leads the world in per capital consumption of beer and carbonated soft drinks, we are the number-one supplier to those markets. In fact, we are the only American manufacturer of beer and carbonated soft drink filling equipment. World's Largest Concert Touring Sound Equipment Company Chooses Finesse ERP System. DENVER, Colo. - January 15, 2002 - Enhanced Systems & Services, Inc.�, the leading vendor of Enterprise Resource Planning software, today announced that Clair Brothers Audio has selected the Finesse software system for its ERP needs. Clair Brothers Audio, located in Lititz, Pennsylvania, is an international, design, rental and installation company with expertise in the fields of audio, video, lighting, staging and rigging for the entertainment and commercial industries. According to Dave Deibler, MIS Manager at Clair Brothers Audio, "Since our company is so project-oriented, we needed an ERP system that could bend itself in certain ways to fit our needs." After looking at several software packages, his company finally decided on Finesse because of its flexibility and capacity to integrate every functional area, enterprise-wide. With huge amounts of rental inventory shipped all over the world, Deibler wanted to be able to track these high-value assets and have a real time scheduling calendar in order to project equipment demand over time. "With so many islands of data all over the company on different databases, our main objective was to find a system that would centralize all of it and replicate it around the world. Bottom line, we needed to make our company more efficient and more profitable and Finesse was the best choice." The Finesse system provides comprehensive ERP functionality for engineer-to-order, make-to-order, assemble to-order, make-to-stock and mixed-mode environments. The suite's sophisticated manufacturing, supply chain, financial and customer service modules - along with powerful project management and engineering capabilities - offer a high level of integration and functional depth, tailored for capital equipment and highly engineered product manufacturing. Because Finesse is highly flexible, customers can choose from 15 different modules. System modules include estimating, quoting, contract terms and conditions, procurement, scheduling, payroll and human resources, and production and post-production service and warranties. In addition, Finesse incorporates a work breakdown structure (WBS) for each project phase and task, a single central data repository, and extensive reporting features and analysis screens. Live production can usually be initiated in as little as 60 days from project inception. Enhanced Systems & Services system consultants are extremely knowledgeable about the requirements of project-oriented manufacturers and can dramatically reduce the implementation time required by using existing, pre-configured templates. Post implementation, Enhanced Systems & Services provides extensive, customized support that includes ongoing consultation, on-site training, remote diagnostics and other services designed to help customers become productive as quickly as possible. 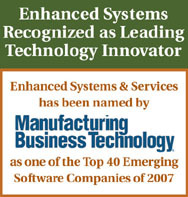 Enhanced Systems & Services, Inc. has been providing ERP solutions for project-oriented manufacturing since 1983. The privately held company's flagship product, Finesse, is targeted at organizations that manufacture capital equipment and other highly-engineered products. The leader in its market, Enhanced Systems & Services serves hundred of customers across the globe in industries such as factory automation, aerospace and defense, transportation, energy and environmental products. Customers include Advanced Technical Products, Ball Corporation, Halter Marine, Teleflex, Trinity Industries, TRW, United Technologies and many other companies that require an industry-specific, enterprise-wide business application suite. Visionwall: custom engineers, manufactures and installs proprietary energy efficient window and curtain wall systems for use in commercial, institutional and industrial buildings.